Critics: Rich Polluters—Including U.S.—Should Face Sanctions for Rejecting Binding Emissions Cuts | Democracy Now! South African climate activist and professor. He is the director of the Centre for Civil Society at the University of KwaZulu-Natal in Durban. He is author of two new books, Durban’s Climate Gamble: Playing the Carbon Markets, Betting the Earth and Politics of Climate Justice: Paralysis Above, Movement Below. Bolivia’s former ambassador to the United Nations. 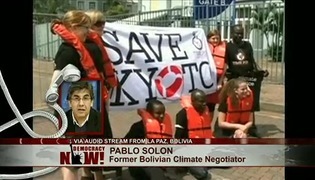 He also served as Bolivia’s chief negotiator on climate change. chair of the Africa Group, representing 54 African nations at the U.N. Climate Change Conference in Durban, South Africa. Mpanu-Mpanu is from the Democratic Republic of Congo. We welcome you both to Democracy Now! Ambassador Solón, well, actually, you’re not ambassador anymore. You’re here really as an activist on the ground. We saw you in Cancún, before that at the People’s Summit in Bolivia. What is happening here right now? As we wrap up, as this conference, the COP 17—it’s officially called the Conference of Parties, others call it the “Conference of Polluters.” What’s taken place, and what do you make of what Todd Stern, the chief negotiator, said? PABLO SOLÓN: Yeah, that’s exactly what happened. In Cancún, most of the delegations knew that what we were saying was the truth, but they said, “We now have to save the climate negotiation at the multilateral level. In Durban, we will save the climate.” But we have come here, and the numbers of emission reductions are the same as the ones that were in Copenhagen and in Cancún. So, it’s really unsustainable.